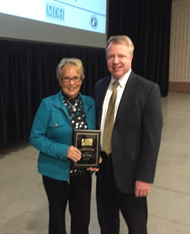 Nancy Johnson, a founding member of Minnesotans for Safe Driving, was awarded the prestigious Katherine Swanson Outstanding Service Award for 2015 from the statewide TZD program. This award recognizes individuals who have shown exceptional leadership in efforts to improve traffic safety in Minnesota, build partnerships, and mentor others in the field. Recipients also have demonstrated a long-term passion, dedication, and commitment to reducing the number of deaths and injuries resulting from crashes on Minnesota roads. She previously served on the state and national board of MADD and was a member and chair of Minnesota’s Victim Reparations Board. As a volunteer with MSD, Nancy assisted victims of traffic crashes, provides training in death notification to law enforcement and others, speaks to groups and manages the MSD website. She also has strong relationships with members of the legislature in her capacity as a volunteer lobbyist and advocates for legal changes that promote public safety. For example, this year Nancy successfully lobbied on behalf of the DWI Task Force for the change in Minnesota’s alcohol enhancement level from .20 to .16, meeting with more than 60 legislators during the process. She also lobbied on behalf of Minnesotans for Safe Driving in 2014 to clarify the hit and Run statue which passed and this year also advocated for change to enhance the penalty for those that kill or seriously injure others in non-alcohol related crashes. This bill also passed this year after 10 years of lobbying. 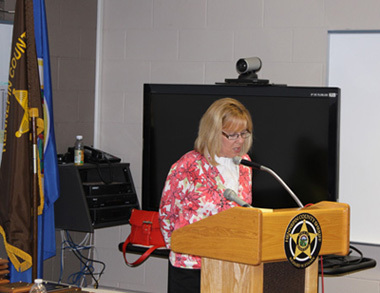 The Minnesota State Patrol had a press conference in April highlighting the work of 9-1-1 radio dispatchers as an important tool in the fight against impaired driving. 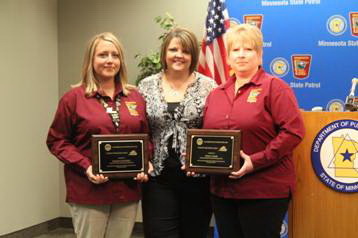 At this news conference in St. Paul, the traffic safety organization,Minnesotans for Safe Drivinghonored two State Patrol radio dispatchers for their outstanding service in the arrests of DWI drivers: Stacy Hass, a 10-year veteran and Sarah Johnson, a 9-year veteran of the agency. 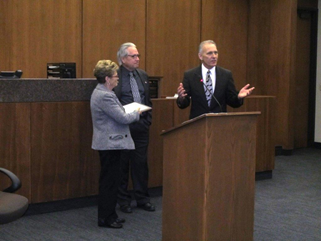 The dispatchers were recognized as a part ofNational Telecommunicators Week, April 10–16. According to the State Patrol, 9-1-1 operators play a vital role in handling driver complaints, investigating those calls, and providing troopers with detailed information by monitoring traffic cameras to locate and track impaired drivers. In 2010, State Patrol dispatchers received 42,000 driver complaints, resulting in 662 DWI arrests. Each year in Minnesota, alcohol-related crashes account for more than 140 deaths and 30,000 motorists are arrested for DWI. “The value of the information dispatchers relay to troopers is immeasurable,” says State Patrol Lt. Eric Roeske. “They are a trooper’s extra set of eyes and ears, and they serve as a vital link between the public and our troopers on the road.” Roeske cites that information from citizens reporting unsafe driving is critical to stopping impaired drivers. The motoring public is encouraged to report impaired driving by calling 9-1-1. Those reporting should be prepared to provide a description of the vehicle — most importantly a license plate number — the location of the vehicle and description of the driver behavior. The State Patrol has 69 operators statewide. Sharon Gehrman Driscoll, director and victim advocate for Minnesotans for Safe Driving was awarded theKathy Swanson Outstanding Service Awardat the October 2010 statewide TZD conference. This conference is a partnership between the Departments of Transportation, Public Safety, Health and the Center for Transportation at the University of Minnesota to advocate for traffic safety, and “Towards Zero Deaths” TZD. 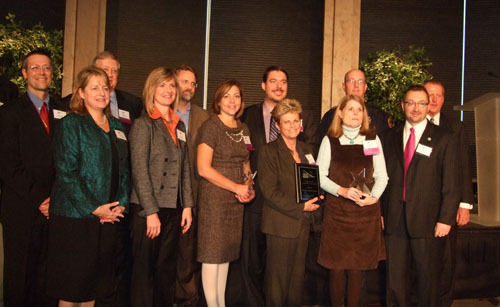 This prestigious award recognizes an individual or individuals who have shown exceptional leadership in efforts to improve traffic safety in Minnesota, build partnerships, and mentor others in the field. Recipients of this yearly award have demonstrated a long term passion, dedication, and commitment to reducing the number of deaths and injuries resulting from crashes on Minnesota roads. 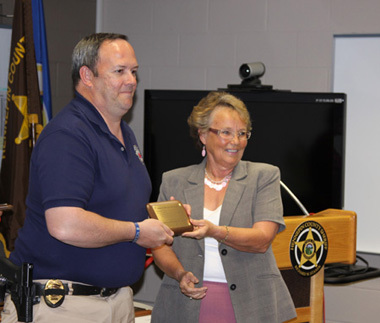 Sharon received this award because she has dedicated more than 26 years to improving traffic safety in Minnesota, including her work with Minnesotans for Safe Driving and MADD. She has promoted legislation involving Ignition Interlock, felony DWI, forfeiture, and vehicle impoundment; worked extensively as a victim advocate and with victim impact panels; and provided training opportunities to law enforcement and first responders. Over the years, Sharon has partnered with law enforcement, the Office of Traffic Safety, the Minnesota Legislature, the courts and many others to keep the public informed on traffic safety issues. Minnesotans for Safe Driving (MSD) is commemorating 10 years of service to Minnesota. To mark the anniversary, survivors and family members of crash victims thanked local law enforcement, the courts and the Star Tribune. some justice after years of disappointment. (with K-9 Razor) and Deputy Dave Higgins. Kelli’s grief was aggravated by what she describes as a series of disappointments in the justice system. The man who killed Lance was convicted on several charges including careless driving, improper change of lanes, and failure to yield the right of way. His 90-day sentence was suspended – he didn’t have to serve the time if he completed court orders, including paying restitution to the victim’s family and completing 100 hours of community service. But the convicted driver frequently disregarded the court’s orders. Kelli and Lance’s parents felt as if they had been victimized again, this time by a system that couldn’t seem to find a way to hold the driver responsible. Time and time again, the family attended court hearings only to be disappointed. Finally, months later, a judge issued a warrant for the driver’s arrest. The Sheriff’s Office Warrant Unit assigned Deputy Eric Johnson to the case. Johnson, a 28-year veteran of the agency, followed leads and showed persistence in searching for the convicted driver. In January 2004, Johnson arrested him. 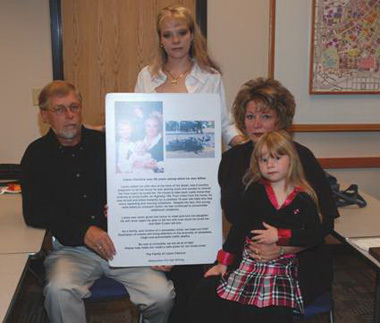 Lance Ciaciura’s family views that day as a turning point for them. “Something is getting done. Finally, something has happened,” said Cathy Ciaciura, Lance’s mother. Though the family was grateful to the Warrants Unit, their grief was still raw. It would take many years before they were emotionally ready to express their thanks in a way that would honor Lance. Five years after Lance was killed, the Ciaciura family held a recognition ceremony at the Hennepin County Sheriff’s Office Warrants Unit in Minneapolis. Kelli brought Lance’s daughter, KeLan, who is now five years old. 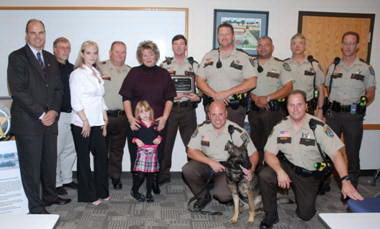 Minnesotans for Safe Driving had assisted the Ciaciura family through the court process and helped them with their grief over the years so they were happy to facilitate this reunion and help the family recognize Deputy Johnson and the Unit.